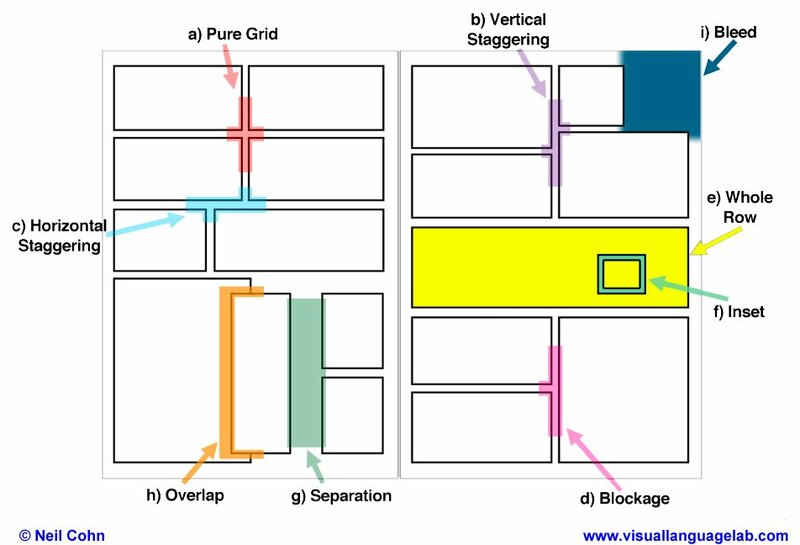 The cultural pages of comics (PDF) - This paper coauthored with my student assistants followed up our analysis of page layouts in superhero comics by comparing page layouts in 60 comics, 10 each from US superhero comics, US Indy comics, Japanese shonen manga, Hong Kong manhua, French bande desinée, and Swedish comics. Overall, we found that cultures differ in their page layout features in patterned and systematic ways. For example, layouts in Asian comics use more vertical segments, while those from Europe and US Indy comics use more staggering of panels within horizontal rows. 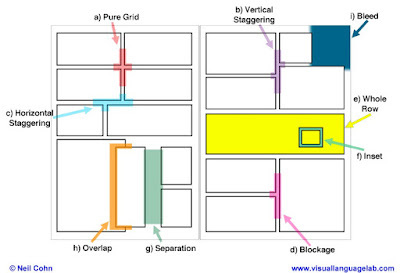 In defense of a “grammar” in the visual language of comics (PDF) - This theoretical paper reviewed my theory of narrative structure, and defended it against critiques that sequential image comprehension requires only meaningful connections between panels. I review and compare the theories, and lay out arguments for why a narrative structure is both necessary and supported by the experimental evidence. I also take the hard line that any proposal for how visual narrative sequences are understood must account for the cognitive results in experimentation. Combinatorial morphology in visual languages (PDF) - In this chapter from the recent book The Construction of Words: Advances in Construction Morphology, I try to formalize the linguistic structure of the morphology ("symbology") of visual representations like hearts or lightbulbs above the head, motion lines, and impact stars. It discusses both how these forms use systematic strategies to combine elements, and the ways they derive meaning through symbolic and metaphorical techniques. Listening beyond seeing (PDF) - My coauthor Mirella Manfredi carried out this cool study which showed people comics, and at the critical panel also played sounds to people. The panel showed an action, while either playing people a spoken onomatopoeia that matched or mismatched the action, or an actual sound effect that matched/mismatched the action. We measured people's brainwaves, and found that their processing of these multimodal meanings partially overlapped, but partially did not. Brainwaves to words and sounds differed at the start of their processing, but in later parts of the processing seemed to not differ, implying some sort of integrative process. Visual Language Theory and the scientific study of comics (PDF) - This chapter appeared in the recent book Empirical Comics Research, which has a wide survey of studies using empirical methods (corpus, computational, cognitive) to study comics. My paper provides a review of my Visual Language Theory, and its structures of vocabulary, layout, and narrative structure. I describe how theories of their structure combines with corpus analysis and psychological experimentation to give us a converging view of how visual languages in comics are built. I think it's a relatively decent introductory paper for people who are unfamiliar with my theories. 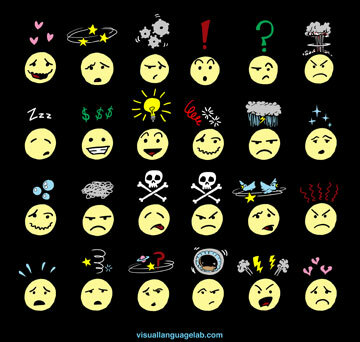 Are emoji a poor substitute for words? (PDF, Poster) - Our conference paper from the 2018 Meeting of the Cognitive Science Society looked at how people process sentences when emoji are substituted for words. We found that people view emoji slower than words in sentences, but even slower when the emoji mismatches the part of speech (ex. a "noun-ish" emoji in verb position). When people read the next word after seeing a congruous emoji, they process it just as easily as seeing an all text sentence, but words after incongruous emoji are still read slower. This suggests that congruous emoji substituted for words can readily be integrated into the syntax of sentences. We also compared logos and emoji substituted in text, and found they didn't differ in their processing. Visual and linguistic narrative comprehension in autism spectrum disorders (PDF) - My first paper with my colleague Emily Coderre compares the brainwaves of neurotypical individuals with individuals with autism while they comprehended both verbal and visual narratives. People have often claimed that autistic individuals do better with visual materials, but we show similar processing deficits for both verbal and visual materials, hinting at a more general issue processing meaning across modalities. This is the first of my papers on autism and visual narratives with Emily, and we've got lots more on tap coming soon. These and all my papers are available on my website here. Michał Szawerna's recent book Metaphoricity of Conventionalized Diegetic Images in Comics: A Study in Multimodal Cognitive Linguistics analyzes a variety of structural aspects of the visual languages of comics by taking a deep dive into Peircean semiotics and cognitive linguistics, particularly conceptual metaphor theory, and cognitive grammar. The book seems to have flown largely under the radar of most discussions of comics theory, but it is interesting in several regards. The book opens with an analysis of the history of scholarship on comics, emphasizing the structuralist and linguistic analyses. Included in this is a discussion of Polish research, which I had not previously seen discussed in other publications. It also extensively covers the semiotic theories of C.S. Peirce and the developments of conceptual metaphor theory over the past 30 years. The substantive chapters then each delve into a different aspect of the structure of comics. This starts with a chapter on the abstract properties of panels and how they convey time across sequences, then progresses to a discussion of depictions of motion (motion lines, polymorphic panels). Chapters then discuss the depictions of sound (balloons), and "mental experiences" (like thought bubbles, upfixes). A concluding chapter then summarizes the overall arguments. The book throughout contains several insightful examples and analyses, and at the least makes one consider the complexity of various visual conventions. For example, the chapter on motion discusses what I've called "polymorphic" representations, where a single panel shows a character repeated in an action to imply motion. Here Szawerna observes that this overall pattern extends beyond motion, and can also depict transformations, like a werewolf's shift from a man to wolf-man. I don't think I've seen this representation discussed in any other paper, and it's nice observation of its similarities to other polymorphic panels. Other observations seem a little overly strong. For example, in the chapter on comic panels, Szawerna takes on the strong McCloudian position that the width of panels has a direct correspondence to time duration. He also claims that images in sequence are directly mapping to a timeline of episodic events (a space = time metaphor), even comparing comics to the grid pattern of days on a calendar. I've long pointed out problems with this view, and support against it has been provided by several experiments. This relates to my first critique of the book. Though the book has many good insights, it ultimatley feels like a case of “if all you have is a hammer, then everything looks like a nail.” That is, the metaphorical interpretations run so rampant throughout that no alternative interpretations are offered nor considered. I don't disagree with metaphorical interpretations of various conventions, but it seems a metaphorical interpretation should be a "last resort" if a simpler explanation is possible. For example, experimentation of motion lines has implied their understanding is not metaphorical or based on our perception of moving objects, but driven largely by conventionalization. Also, while the work is clearly well-researched, at times references seem selective or miss important arguments. For example, in the introductory chapter, Szawerna critiques my notion of visual language on the basis of Hockett’s design features for language, claiming that visual languages cannot be languages because they do not exhibit thing like duality of patterning or arbitrariness. However, these issues are addressed in the second chapter of my book, which is cited, and perhaps more importantly, does not acknowledge that those features do not hold up for sign languages, nor are they even consistent descriptors of spoken languages. My second main critique of the book relates to cognition. 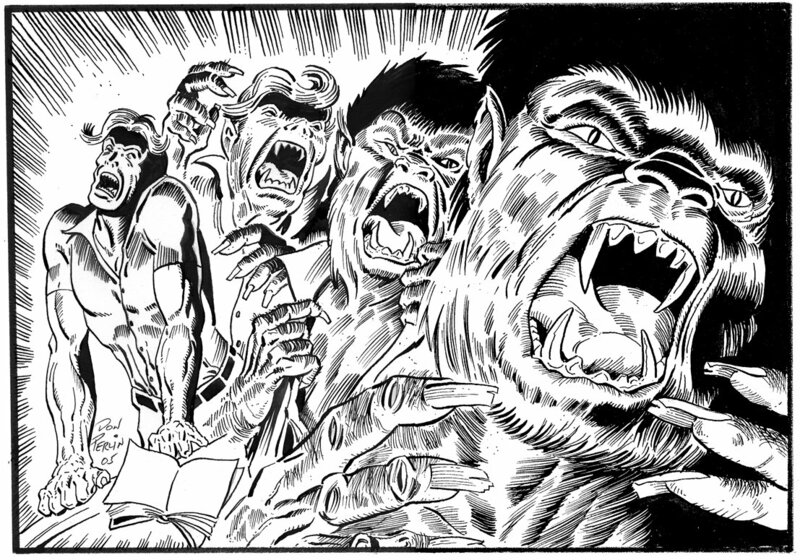 Mostly the book seeks describe what is happening in the visual language of comics, often in very intense details. But, these often amount to just giving labels to things, falling short of explaining the mechanisms and cognitive processes involved in these representations. Granted, description is important too, but I would have hoped for more of a balance. More concerning is the repeated invocation for the “psychological reality” of the argued analyses, despite no evidence being provided for such interpretations. There are no theoretical diagnostic tests, nor is any empirical literature discussed, even though there has been relevant psychological experiments about many of the issues under analysis. Claims of "psychological reality" need to engage the actual experimental cognitive literature, as should any theoretical claims about how "comics work." For example, the experimental literature would especially be useful to examine Szawerna's claim that people transparently understand images and conventions in visual languages (which he attributes to Miodrag). The empirical literate actually shows cultural differences for many conventions that occur in comics (and even basic drawings). Also, developmental psychology has shown trajectories for learning to understand basic images, image sequences, and morphemes like motion lines and carriers. Szawerna uses the assumption of transparency to ground claims of metaphoric knowledge motivated by universal and embodied understanding, but the literature does not seem to support this (although, non-transparency does not rule out a metaphoric interpretation). Finally, it should be noted that stylistically this book is not an easy read, particularly for those who don't often read research on linguistics. It is often weighed heavily by jargon and exceedingly long sentences. Some serious copyediting could beneficially cut at least a third of the book's 490 page length. This would have been useful, as I fear that sometimes the book’s insights are buried beneath the prose. Criticisms aside, the book seems like it would be important for scholars to engage if they are interested in the understanding of these elements of visual vocabulary and/or visual metaphor. In addition, this book seems to be a landmark in the study of the visual language of comics for what it does. It is the first, to my knowledge, to devote a book extensively to rigorously analyzing just a few structural features of the visual domain. Such depth of analysis is indicative of the growing seriousness and sophistication of the linguistic and cognitive approach to visual languages, hopefully making Szawerna's book a harbinger of further works to come. Szawerna, Michał. 2017. 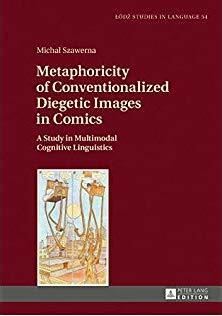 Metaphoricity of Conventionalized Diegetic Images in Comics: A Study in Multimodal Cognitive Linguistics, Łódź Studies in Language 54: Peter Lang Publishing. My new paper with my collaborator, Emily Coderre, is finally out in Brain and Language. Our paper,"Visual and linguistic narrative comprehension in autism spectrum disorders: Neural evidence for modality-independent impairments," examines the neurocognition of how meaning is processed in verbal and visual narratives for individuals with autism and neurotypical controls. We designed this study because there are many reports that individuals with autism do better with visual than verbal information. In the brain literature, we also see reduced brainwaves indicative of semantic processing for language processing in these individuals. So, we asked here: are these observations about semantic processing due to differences between visual and verbal information, or is it due to processing meaning across a sequence. Thus, we presented both individuals with autism and neurotypical controls with either verbal or visual narratives (i.e., comics, or comics "translated" into text) and then introduced anomalous words/images at their end to see how incongruous information would be processed in both types of stimuli. We found that individuals with autism had reduced semantic processing (the N400 brainwaves) to the incongruities in both the verbal and visual narratives. This implies that it's not a deficit in processing of a type of modality, but in a more general type of information processing. The full paper is available at my Downloadable Papers page, or at this link (pdf). Individuals with autism spectrum disorders (ASD) have notable language difficulties, including with understanding narratives. However, most narrative comprehension studies have used written or spoken narratives, making it unclear whether narrative difficulties stem from language impairments or more global impairments in the kinds of general cognitive processes (such as understanding meaning and structural sequencing) that are involved in narrative comprehension. Using event-related potentials (ERPs), we directly compared semantic comprehension of linguistic narratives (short sentences) and visual narratives (comic panels) in adults with ASD and typically-developing (TD) adults. Compared to the TD group, the ASD group showed reduced N400 effects for both linguistic and visual narratives, suggesting comprehension impairments for both types of narratives and thereby implicating a more domain-general impairment. Based on these results, we propose that individuals with ASD use a more bottom-up style of processing during narrative comprehension. Coderre, Emily L., Neil Cohn, Sally K. Slipher, Mariya Chernenok, Kerry Ledoux, and Barry Gordon. 2018. "Visual and linguistic narrative comprehension in autism spectrum disorders: Neural evidence for modality-independent impairments." Brain and Language 186:44-59. 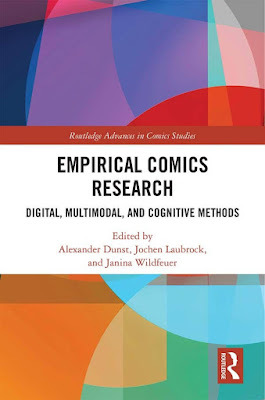 My latest paper is a chapter in the exciting new book collection, Empirical Comics Research: Digital, Multimodal, and Cognitive Methods, edited by Alexander Dunst, Jochen Laubrock, and Janina Wildfeuer. The book is a collection of empirical studies about comics, summarizing many of the works presented at the Empirical Studies of Comics conference at Bremen University in 2017. It's fairly gratifying to see a collection like this combining various scholars' work using empirical methods to analyze comics. I've been doing this kind of work for almost two decades at this point, and most if it has been without many other people doing such research, and certainly not coming together in a collaborative way. So, a publication like this is a good marker for what is hopefully an emerging field. My own contribution to the collection is the last chapter, "Visual Language Theory and the scientific study of comics." 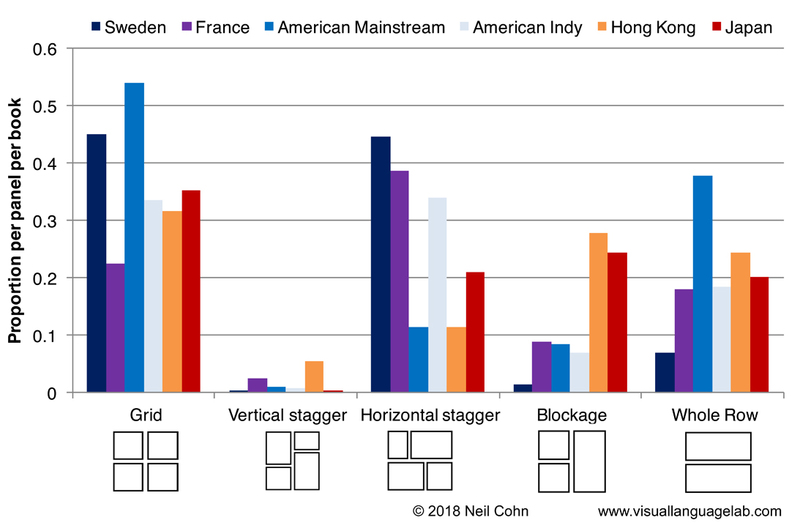 I provide an overview of my visual language research across the fields of the visual vocabulary of images, narrative structure, and page layout. I also give some advice for how to go about such research and the necessity of an interdisciplinary perspective balancing theory, experimentation, and corpus analysis. The emphasis here is that all three of these techniques are necessary to make progress, and using one technique alone is limiting. Cohn, Neil. 2018. Visual Language Theory and the scientific study of comics. In Wildfeuer, Janina, Alexander Dunst, Jochen Laubrock (Ed.). Empirical Comics Research: Digital, Multimodal, and Cognitive Methods. (pp. 305-328) London: Routledge. Our new paper has just been published in Brain and Language, titled "Listening beyond seeing: Event-related potentials to audiovisual processing in visual narrative." My collaborator Mirella Manfredi carried out this study, which builds on her previous work looking at different types of words (Pow! vs. Hit!) substituted into visual narrative sequences. Here, Mirella showed visual narratives where the climactic event either matched or mismatched auditory sounds or words. 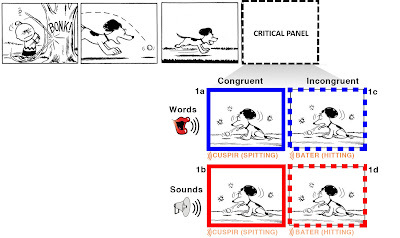 So, like the figure to the right, a panel showing Snoopy spitting would accompany the sound of spitting or the word "spitting". Or, we played incongruous sounds, like the sound of something getting hit, or the word "hitting." We measured participants brainwave responses (ERPs) to these panels/sounds. We found that these stimuli elicited an "N400 response"—which occurs to the processing of meaning in any modality (words, sounds, images, video, etc.). We found that though the overall semantic processing response (N400) was similar to both stimulus types, the incongruous sounds evoked a slightly different response across the scalp than the incongruous words. This suggested that, despite the overall process of computing meaning being similar, these stimuli may be processed in different parts of the brain. In addition, these patterned responses very much resembled what is typical of showing words or sounds in isolation, and did not resemble what often appear to images. This suggests that, despite the multimodal image-sound/word interaction determining whether stimuli were congruent or incongruent, the semantic processing of the images did not seem to factor into the responses (or, was equally subtracted out across stimulus types). So, overall, this implies that semantic processing across different modalities uses a similar response (N400), but may differ in neural areas. You can find the paper here (pdf) or along with my other downloadable papers. Every day we integrate meaningful information coming from different sensory modalities, and previous work has debated whether conceptual knowledge is represented in modality-specific neural stores specialized for specific types of information, and/or in an amodal, shared system. In the current study, we investigated semantic processing through a cross-modal paradigm which asked whether auditory semantic processing could be modulated by the constraints of context built up across a meaningful visual narrative sequence. 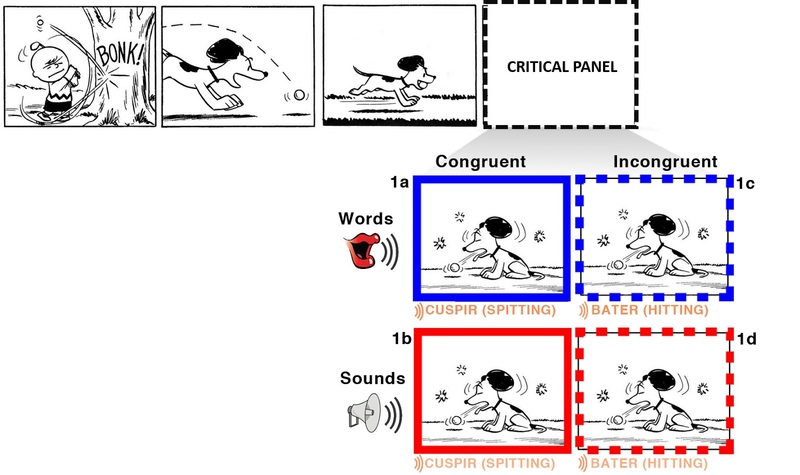 We recorded event-related brain potentials (ERPs) to auditory words and sounds associated to events in visual narratives—i.e., seeing images of someone spitting while hearing either a word (Spitting!) or a sound (the sound of spitting)—which were either semantically congruent or incongruent with the climactic visual event. Our results showed that both incongruent sounds and words evoked an N400 effect, however, the distribution of the N400 effect to words (centro-parietal) differed from that of sounds (frontal). In addition, words had an earlier latency N400 than sounds. Despite these differences, a sustained late frontal negativity followed the N400s and did not differ between modalities. These results support the idea that semantic memory balances a distributed cortical network accessible from multiple modalities, yet also engages amodal processing insensitive to specific modalities. Manfredi, Mirella, Neil Cohn, Mariana De Araújo Andreoli, and Paulo Sergio Boggio. 2018. "Listening beyond seeing: Event-related potentials to audiovisual processing in visual narrative." Brain and Language 185:1-8. doi: https://doi.org/10.1016/j.bandl.2018.06.008. I'm excited to announce that my new paper, "In defense of a 'grammar' in the visual language of comics" is now published in the Journal of Pragmatics. This paper provides an overview of my theory of narrative grammar, and rigorously compares it against other approaches to sequential image understanding. Since my proposal that a "narrative grammar" operates to guide meaningful information in (visual) narratives, there have been several critiques and misunderstandings about how it works. Some approaches have also been proposed as a counterpoint. I feel all of this is healthy in the course of development of a theory and (hopefully) a broader discipline. In this paper I address some of these concerns. I detail how my model of Visual Narrative Grammar operates and I review the empirical evidence supporting it. I then compare it in depth to the specifics and assumptions found in other models. Altogether I think it makes for a good review of the literature on sequential image understanding, and outlines what we should expect out of a scientific approach to visual narrative. The paper is available on my Downloadable Papers page, or direct through this link (pdf). Visual Language Theory (VLT) argues that the structure of drawn images is guided by similar cognitive principles as language, foremost a “narrative grammar” that guides the ways in which sequences of images convey meaning. Recent works have critiqued this linguistic orientation, such as Bateman and Wildfeuer's (2014) arguments that a grammar for sequential images is unnecessary. They assert that the notion of a grammar governing sequential images is problematic, and that the same information can be captured in a “discourse” based approach that dynamically updates meaningful information across juxtaposed images. This paper reviews these assertions, addresses their critiques about a grammar of sequential images, and then details the shortcomings of their own claims. Such discussion is directly grounded in the empirical evidence about how people comprehend sequences of images. In doing so, it reviews the assumptions and basic principles of the narrative grammar of the visual language used in comics, and it aims to demonstrate the empirical standards by which theories of comics' structure should adhere to. It was with much surprise and a heavy heart that I learned last week that my friend and colleague Dr. Martin Paczynski suddenly passed away. Martin and I met in 2006 when I entered graduate school at Tufts University, and he was the first graduate student working with our mentor Gina Kuperberg (I was her second). He quickly grew to be a close collaborator, a mentoring senior student, my first choice for brainstorming, and my best friend throughout graduate school. Here, I'll honor his place in the sciences and my work. It's always a nice benefit when your closest colleagues are smarter than you, and that meant Martin's influence on me and my research is everywhere. 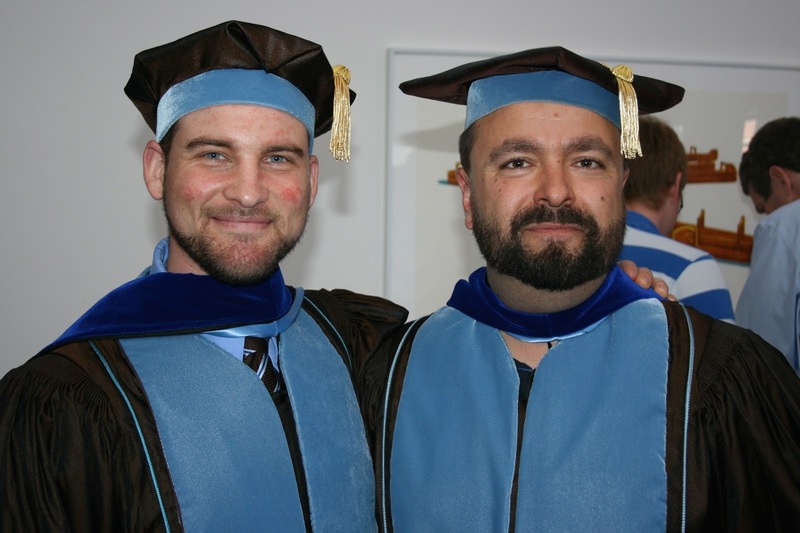 He essentially trained me in using EEG, and helped me formulate and analyze countless studies. Though he started the program a year before me, we graduated together, which I think made it all the more special. Though he initially studied computer science and worked in that field, Martin's graduate work at Tufts focused on the neurocognition of linguistic semantics, though he was knowledgeable in many more fields. His early work focused on aspects of animacy and event roles. He later turned to issues of inference like aspectual coercion—where we construe an additional meaning about time that isn't in a sentence, such as the sense of repeated action in sentences like "For several minutes, the cat pounced on the toy." His experiments were elegant and brilliant. Our collaborative work on my visual language research started with my first brain study, for which Martin was the second author. After graduate school we co-authored our work on semantic roles of event building, which united our research interests. This continued until just recently, as my most recent paper again had Martin as my co-author, directly following our earlier work, almost 6 years after we left graduate school together. And it wasn't just me: he is a co-author on many many people's work from our lab, which speaks to both his generosity and insightfulness. After graduation, Martin's interests moved away from psycholinguistics, more towards research on mindfulness, stress, and other clinical and applied aspects of neurocognition. For many years he talked about one day studying architecture and design using EEG, but hadn't implemented those ideas just yet. There seemed to be no topic that he couldn't excel at when he applied himself. He was warm, kind, creative, funny, brilliant, and intellectually generous. I like to especially remember him with a mischievous grin, foreshadowing a comment which would inevitably be both hilarious and astute. The sciences have lost a spark of insight in Dr. Martin Paczynski, and the world has lost a progressive and compassionate soul. I've lost that and more. Safe travels my friend.